PC Games > Card & Board Games > BeTrapped! BeTrapped! is rated 4.4 out of 5 by 13. Rated 5 out of 5 by FernWillow1 from Be Trapped! Love this game! Minesweeper & Clue combined! (Not a fan of Minesweeper, but I love this version.) Have played over and over through the years. A keeper! Rated 5 out of 5 by Fiddler_Girl from Wonderful! A wonderful game I play over and over! I recommend this for any age! Rated 5 out of 5 by Listless_Sleeper from Excellent replay value! I have had this game for years and replayed it many times. That is the ultimate decider in whether a game is worth the purchase price. I bought it long ago through another vendor and when my laptop pooped out, I bought it again here because it's so fun. 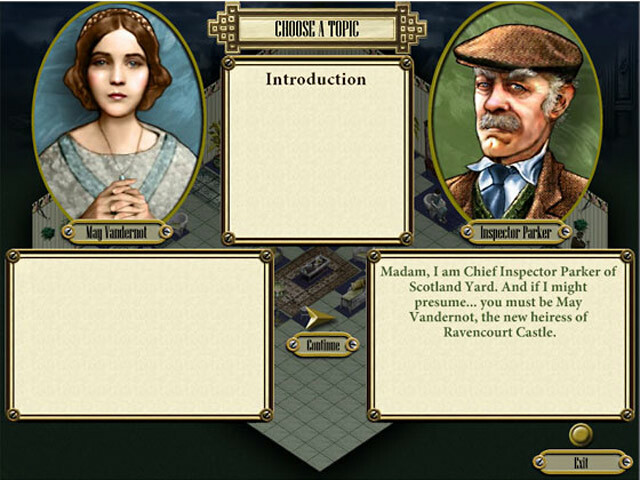 Adventure mode allows you to glean clues, but also to interact with the characters and gain information to help solve this classic whodunnit. Even after you solve the mystery, just playing in puzzle mode is still enjoyable. Rated 5 out of 5 by Zellian from Truly Unique I've played through this game about 3 times now (adventure mode) and it's fun each time as I usually wait a couple years between play-thrus. The reason for this is because the trap locations do not change in adventure mode, which is arguably the game's only flaw. This game is a decade old so if you value graphics over gameplay, it might not be for you. The puzzle mode offers a lot of replay value, but I find it kind of empty and unfulfilling in comparison to adventure mode. Unfortunately there is no sequel to this game, because it seriously deserves one! One of the best and most unique games in all of the BFG catalog. Rated 5 out of 5 by MissouriG from Fun and Challenging Game I agree with the previous reviewer that if the villian changed each time you played it would increase interest in the ending. However the visuals are wonderful and the levels are challenging. I have owned this game for several years and I still play it periodically. 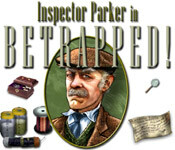 If you enjoy this one then you will enjoy Inspector Parker which is like a kind of sequel or prequel. It is a logic game of figuring out motive, murderer, weapon and room. Changes everytime and increases in difficulty as you advance. Again Betrapped itself is a great game. Rated 5 out of 5 by amilahani from One of a kind The game is very unique on its own. Basically, you play as Inspector Parker, who went to a mansion to investigate a murder. While you're searching for clues (its highlighted areas, shouldn't have any problem), and talking to suspects, you also have to search for any traps in every room. I love it for its uniqueness. My only cons is that the murderer is always the same, so it can get boring after few plays. but the traps design is amazing. Too bad they don't have any sequel. Rated 4 out of 5 by dauguy from Minesweeper, grown up Entertaining enough game. 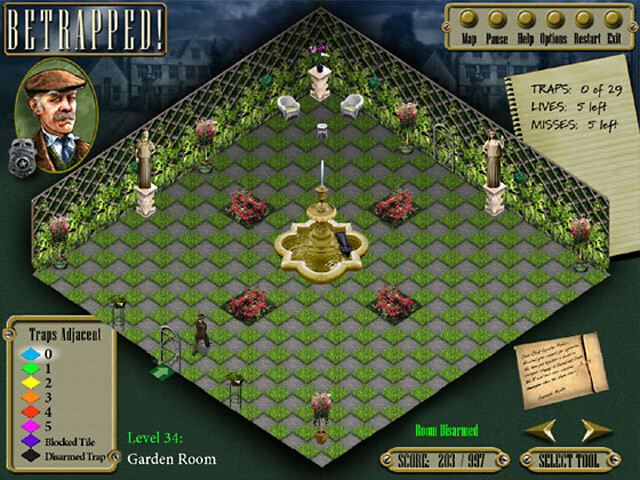 The clearing the boobytraps portion is Minesweeper with graphics; solving the mystery is reminiscent of the old Clue board game, where you determine the person who committed the murder. For me, the replayability came in the Puzzle mode, where you may select level of difficulty and then clear rooms of traps. Rated 4 out of 5 by SylvanNun from Unique puzzle game Though this is an older title, it's still a fun one to play because there aren't any other games out there like it that I've come across. This is one of those mystery games where almost anyone could have been the murderer, but once more and more characters start dying, they give you enough clues to figure it out if you really think about it. I got it wrong the first time but now see where I went wrong. The great thing about it is that if you choose incorrectly at the end you are still able to finish the game. Watch out for the moaning ga-gorib and have fun!